In this very basic test, I show how much slower running PowerShell commands in WFA is versus running the equivalent Perl command, and then demonstrate PowerShell speed without WFA. The lab has a Windows 2008R2 Enterprise Server, with OnCommand Workflow Automation 4.1 installed. We create a very simple workflow using the NetApp provided ‘Create CIFS Share’ command (which is provided with PowerShell and Perl code). The workflow has ‘Row Repetition’ set to 10. The lab has an ONTAP 9.1 simulator. We run the workflow once using the PowerShell command, then flip the ‘Preferred order for language selection’, and run the workflow again using the Perl command. 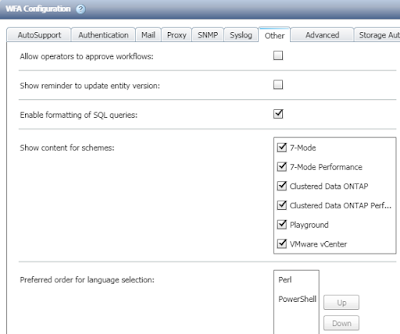 Then we create 10 CIFS shares outside WFA using the DataONTAP PowerShell toolkit. Note: The WFA and PowerShell results were with Certificate Revocation having been disabled as per 1.6 in this post.